Home > Interactive Reading Books > Interactive Reading Books - Set 1 > How Many? 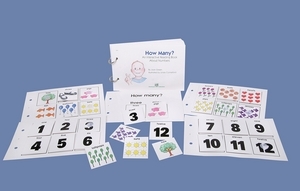 This book teaches students to match, identify, label and sequence numbers 1-12. There are 4 picture pages and 12 sentence pages from which students learn to read number words one through twelve and simple nouns (ex: six suns). 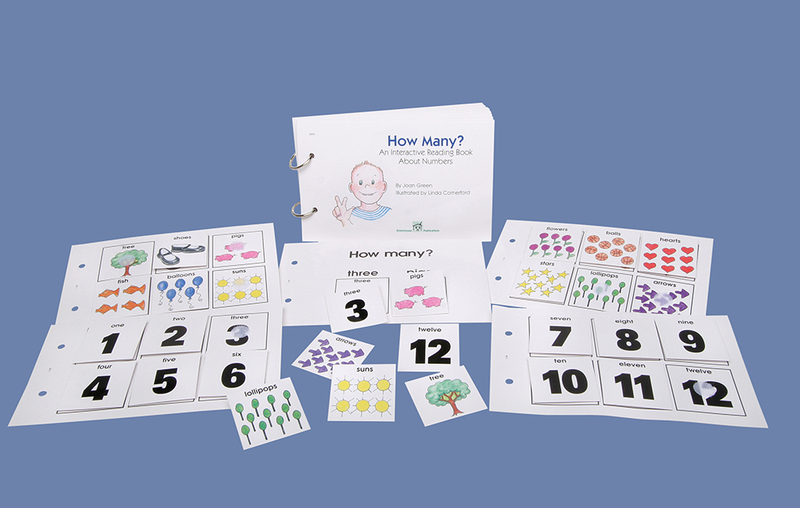 Quantity concepts are taught by matching number to picture and picture to number. (ex: Have the student put the number "2" card on the picture that has 2 "shoes" or the student picks a picture card, counts the items and places it on the appropriate number card.) Simple math activities can also be performed. (ex: Using the picture cards: 2 shoes + 3 pigs= ? Answer: the number card 5) or (ex. Using the number cards: 3 + 4=? Answer: the student finds the picture card of 7 balloons) Click on the picture icon above to enlarge for better viewing. Extra Picture Cards can be used to replace lost or damaged cards, can be placed in AAC devices for communication or used to create new sentences and games!